A:Yes.It's definitely.Just turn off the T icon in the main menu. A:NO,it is easy to set the camera according to the step-by-step picture manual,Quick use guide on Youtube as well.You can search on youtube for "Hill Li Spy camera"
A:Just use a needle to insert the reset hole.About 8 SECS to restore factory settings. Q:will not connect with my wifi. 12 Hour System: Specially customized 12-hour system which is easier to read time than 24 hour system. 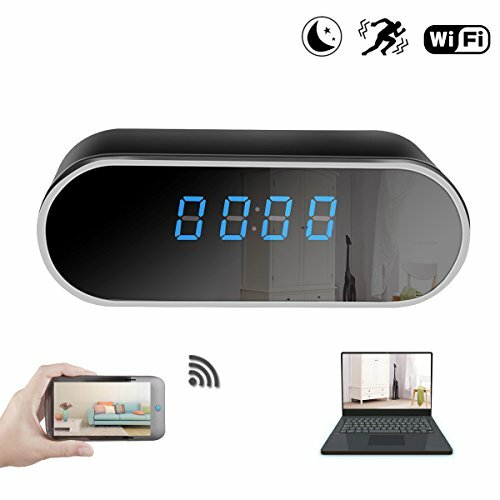 Wifi Clock Camera:It is a simple table clock with a HD camera built-in,nobody will realized this is a camera,you can see exactly what happened when you were not in your home,office,business,or any need a secret safe place. Motion Detection: Alarming Notifications will be transferred to your Smartphone when the motion detection is activated,and it will record at the same time. Night Vison: The clock camera work well at night.It won't miss any moment.IR night vision goes better when the unit is being charged, but these special IR lights are totally invisible to the human eye. 1080P HD: The video resolution 1920 x 1080P,you can see exactly what's going on through video.Included 2000 mAh rechargeable battery. If you have any questions about this product by KAMRE, contact us by completing and submitting the form below. If you are looking for a specif part number, please include it with your message.